On Monday we celebrated my mom’s birthday. I must say it was quite a success, she enjoyed it very much. And obviously, because we were celebrating her, she was not allowed to cook. I immediately volunteered to “cook” the appetizer because what she wanted to have was just up my alley, a combination of baking and cooking. I am sure you are probably thinking, “TT Jr., filling strawberries with soft cheese has nothing to do with baking, you don’t even need to cook it.” Now, I was thinking of the filling when I said baking because it reminds me the slightest bit of a sort of cheese danish filling, soft, cheesy, and sweet. And, also, when I think of strawberries (or Shari’s Berries) I think of dessert, and any form of dessert is baking, unless it is frozen, like ice cream. Although, ice cream sandwiches are baked because of the cookie. Gosh, I am just an enormous bundle of contradictions today, aren’t I? Anyway, let’s get back on track. Here is the recipe for my mom’s birthday strawberries. Core the strawberries deeply. 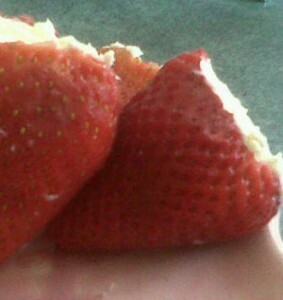 Make sure the hole is at least halfway through the strawberry. If you can’t do this with just a paring knife, use a spoon and scoop some of the inside out. Stir the cheeses and sugar until the cheese mixture is soft. If you can’t get it soft enough, you can microwave it for about 15 seconds. Measure out about half a teaspoon to a full teaspoon, depending on the size of the strawberry, of the cheese mixture and place the filling into the hole you made. Chill for about 30 minutes or until the filling firms back up a tiny bit and everything is nice and cold. If you want to take them to the next level, the chocoholic level, you can dip them in your favorite melted chocolate and chill again. If you don’t like chocolate, you can sprinkle them with another tiny pinch of sugar or garnish them with a few sprigs of mint.